When I travel, I seek out local synagogues and other places of Jewish significance. I want to see my global Jewish family and learn about how they live. But more and more, I find that I am mostly learning about how they died. My curiosity, I suspect, is a way of making up for lost time. Unlike many of my American Jewish counterparts, I did not grow up attending Hebrew school or Jewish summer camps. Indeed, for much of my childhood I was unaware that I was Jewish at all. When my parents—products of the fiercely atheist Soviet Union who moved our family to the United States in 1994—decided to impart some religion to me, it was my Christian father who took up the mantle. It wasn’t until I was 12, six years after we immigrated, that I was told that having a Jewish mother makes you Jewish—a fact that led me to explore what it means to be a Jew. Once I did, it felt like a homecoming of the soul. On my Italian honeymoon in 2016, I unexpectedly found myself at the synagogue in Siena. My husband, Luis, and I had just spent a few hours exploring the breathtaking Duomo di Siena, meant to rival neighboring Florence’s cathedral in size and opulence, built of marble and dotted liberally with gold. We had clambered up seemingly endless medieval stairs to take in the dizzying views from the roof of the duomo, whose hilltop placement meant it dominated the Sienese skyline and guaranteed we could see it from every angle. Wandering around after visiting the majestic Christian sight, we spied on a nearby wall a small paper sign with an arrow and the word “Sinagoga.” The arrow led us to an unassuming brick building; nothing identified it as a synagogue save for two plaques at the entrance commemorating Jews who had died. Inside, we were greeted by a kindly Italian woman. She was working alone, surrounded by Judaica souvenirs and black-and-white photographs of the Jewish community that once was. There was no crowd and no line to get in. I got the impression she didn’t receive many visitors when she eagerly offered us a discount and left her post unattended to walk us around the space. As she led us into the heart of the building, she recounted the synagogue’s history. 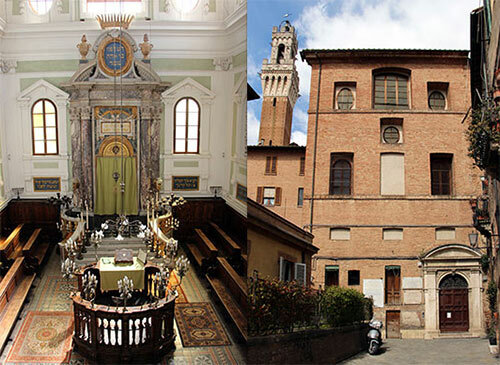 It was built in 1786—well before Italy emancipated its Jews in 1861—during a time when Jewish places of worship had to be secret, unidentifiable from the outside. Here, there were no magnificent views or marble altars. Instead, I admired the relative simplicity of the rich wood paneling, the mint-colored walls and the dozen or so candelabras arrayed around the bimah, standing Sephardi-style in the center of the sanctuary. Our guide recounted the somewhat unexceptional history of Siena’s Jews. Locals blamed their Jewish neighbors for a plague that swept through the area in 1348. Beginning in the mid-16th century, Jews were forced to live in a ghetto, their careers restricted to moneylending and banking. The community never endured significant bloodshed, perhaps because at its peak in the 18th century, Siena only counted 500 Jews. Unlike other European cities, the Jewish population here was not decimated overnight by deportations to death camps and turned to ash and smoke. It dwindled slowly, down from those 500 to the couple dozen Jews who remain today. The Jews of my birthplace were not so lucky. The capital of Moldova, Chisinau—once known as Kishinev—may not be a household name, but it helped introduce the word pogrom into the international lexicon after two brutal massacres in the early 20th century. Jews first settled in Chisinau, and the general region where it’s located, Bessarabia, as early as the 15th century. During czarist times, it was part of the Pale of Settlement, effectively a massive Jewish ghetto outside of which Jews were not allowed to live or travel. This meant that the region was heavily Jewish; at the end of the 19th century, Jews accounted for half the population of Chisinau. But that provided little solace in the face of restrictive racial laws, gulags and, after the Nazi takeover, concentration camps and killing fields. Today, most estimates put the population of Jews in Moldova below 10,000. Visiting Chisinau’s Jewish neighborhood with my mother a few summers ago, I watched her soak up bittersweet memories of her childhood home while standing on the same street where the 1903 pogrom began. I followed her down dusty roads as she searched with almost childlike enthusiasm for places that bore no considerable historical significance but held great value to her. 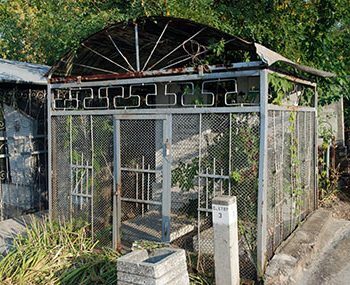 In the Jewish cemetery, we paid our respects at her grandparents’ graves, enshrined in a thick metal cage meant as protection from vandals. 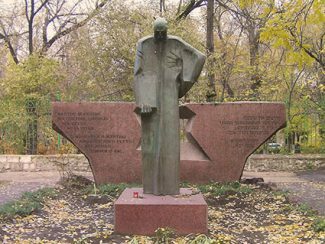 In the Chisinau ghetto, we saw the memorial to Jews killed in the Holocaust: a statue of an old man, standing like a ghost at the end of a street, shrouded in the gloom of a dusk without street lamps. Sometimes, the reminders of our collective pain are a bit grander. On our honeymoon, my husband and I also traveled to Rome. We visited the Arch of Titus, built in 82 C.E. to celebrate Rome’s conquest of the Jews of Judea. Famously depicted on one relief panel is a scene of the Roman army looting Jerusalem’s Temple—including the menorah. Not shown are the estimated 50,000 Jewish slaves the Romans marched back to Europe and forced to build this very arch, along with the Colosseum and other classical monuments. 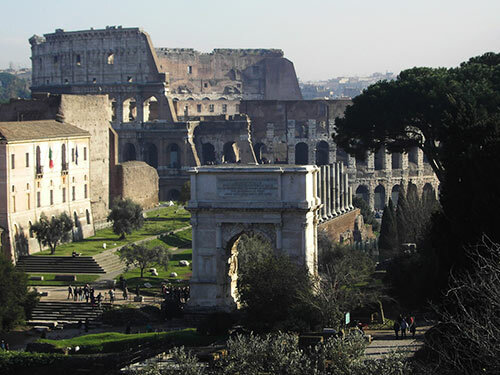 Ironically, it was in front of the Colosseum and steps away from the arch that years earlier, on a previous trip to the Italian capital, I witnessed a truly exhilarating glimpse of Italian Jewry. In June 2010, the city of Rome held a rally for the release of Gilad Shalit, the Israeli soldier kidnapped by Hamas and—at that point, before his 2011 release—held captive for four years. Authorities turned off the lights of the Colosseum for the occasion, something that otherwise only happens on Earth Day. The mayor of Rome, Gianni Alemanno, and the soldier’s father, Noam Shalit, both gave speeches. Now, as my outlook on European Jewry becomes bleaker, I remind myself of that night, which stands as a challenge to my worldview: the darkness of the Colosseum, the energy in that crowd, and a curly-haired little girl of no more than 4 years old, holding her father’s hand, wearing a Free Gilad T-shirt as a dress. But walking through the silent halls of Siena’s synagogue, I realized that no matter where I go in Europe, so many places of Jewish interest evoke sadness. They are places of memory, not of life. The refrain is the same whether I go to Moldova, Italy or France: This is how the community was, once, before the pogroms, war or the economic downturn. At the online Jewish Virtual Library, the entry about Siena’s Jews ends thus: “Not much remains of the Jewish community of Siena.” To me, that statement rings true of more than just Siena. But there is a land that represents the rebirth of the Jewish people: Israel, where Jewish life flourishes, breathes, celebrates and worships today, in the footsteps of ancestors who did the same thing for thousands of years. Israel is for the living. Europe is becoming nothing but a memorial to dead Jews. America, for its many advantages, is a country where you can be Jewish, but it is not dedicated to Jewish life, and that’s fine—it’s a haven for many different peoples. Before my first trip to Israel, I was unaware how Jewish life should look and feel: The sight of a teenage boy break dancing on Saturday night with his tzitzit dangling from his waist, a sense of belonging to the mishpacha. It should not be hiding outward displays of Jewishness for fear of attack, such as the one on a 17-year-old Jew who was beaten by a group of 10 men in Düsseldorf, Germany, in July for wearing a kippah and Israel pin. It should be contemporary Jewish art and architecture on display, statues of heroes and visionaries; our identity should not be reduced to memorials. According to the Jewish Agency for Israel, an average of 5,000 Jews annually make aliyah from France—home to the third largest Jewish community in the world—a number that has been steadily climbing since 2012. Maybe as more Jews leave Europe, we will unyoke ourselves from the idea that we’re European. Maybe now, we can appreciate Europe for what it is—a cradle of art, culture and beauty; a mecca for connoisseurs of fine foods, wines and luxury goods; a place of incredible history, including Jewish history. But we also need to acknowledge what it’s not: home. Hungry after our synagogue tour in Siena, my husband and I found a family-owned cucina casalinga, a restaurant featuring home-style cooking located in Siena’s former Jewish ghetto. Inside, the cozy brick space was full of locals enjoying a simple but delicious meal. Our server was a friendly woman in her early 20s with a cheeky smile and a couple of ear piercings. She bustled around smiling at patrons, joking with regulars as she delivered dishes. When she turned to take someone’s order, I noticed a Hebrew tattoo below her neck. Because my knowledge of Hebrew is poor, I asked her what it meant. She seemed a little surprised but not displeased, and her smile took on a warm glow as she told me it was the initials of her brothers’ names, the same way I smile when talking about my brother. With that, she hurried off to assist another table. The gloom I’d felt in Siena’s empty synagogue was somewhat dispelled by this unexpected meeting with someone I assumed was Jewish, though I couldn’t be sure. Although these meetings today seem to be rare in Europe, I was excited to run into Jewish family all the same. For a moment, it felt like home. Tatyana Sundeyeva, originally from Chisinau, Moldova, is a Russian-American writer and novelist living in San Francisco. Find her online at TatyanaWrites.com and on Twitter @TeaOnSundey. Great article! I enjoyed reading it. Татьяна, спасибо. Ваши путевые заметки всегда больше, чем заметки. Ваше отношение-это то, что их выделяет из сонма стандартных Ах-ов и Ох-ов. Как точно Вы заметили, что Европа-это все. Но не дом. И еше-пустой молитвенный зал в Сиене, списки мертвых… Вот то, что очень многим бы хотелось, чтобы так и было. Как шумерские табл;ички. Говорить о евреях в прошлом времени. Но нет, есть Изриль, и пусть подавятся все те, кто не может проглотить слово есть. Всегда зду с интересом Ваших публикаций. Как говорят на Украине-У неи е хыст. А по-русски: у нее талант. I POSTED MY COMMENT YESTERDAY. NO SIGN OF IT TODAY. Very clear writing. Sounds like quiet music. Good definition of Europe as memorial to the dead Jews. Tatyana, Thank you very much for your article. I was born in Kishinev, emigrated to USA many years ago. Empty synagogue in Sienna is a symbol of many more around Europe. Every country has them now like monuments to Jewish communities once existed here before WWII. This makes all of us very sad, since in many places have no Jews to have services in this empty buildings. Mostly they are museums to visitors like you and us. Tanechka, Thank you very much for your article. Beautifully written by beautiful soul. Beautifully written, but very sad story. Thank you Tatiana, you writing with heart. Long live Israel and Jewish people! Tanya, nice essay. 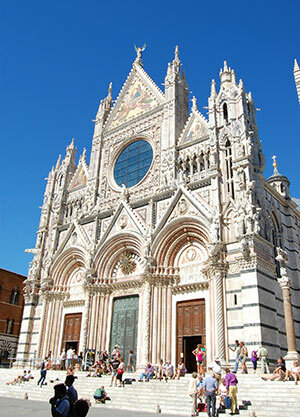 I’ve been in Siena, seen the gorgeous Duomo and the humble sinagoga nearby. The term “getto” was housed by Italians, as you probably know, the first one was in Venezia which has a large display of Jews, that died in a war. Next time you visit Italy, this getto is not to be missed, so sad and impressive. By the way, there are a number of films about Jews and their persecution in Italy. Most people saw relatively recent “Life is Beautiful”, but my personal favorites are less known “The Special day” with Sophia Loren and “The Garden of the Finzi-Continis”. Sincerely, Alla. Your mom and me know each other, she is very proud of you. Good luck writing. :-).